Hiroko's Place always has a large number of Japanese filling its tables but today was rather extreme as I was the only non-Japanese speaker in the whole joint. I think I'm turning Japanese! Hiroko's Place probably doesn't fit the foreigner's perception of all things "Japanese" and to top it off there is the added twist of the you-shoku style cuisine. So you have a genuine Japanese restaurant serving real you-shoku entrees that are actually Japanese reinterpretations of Western food. 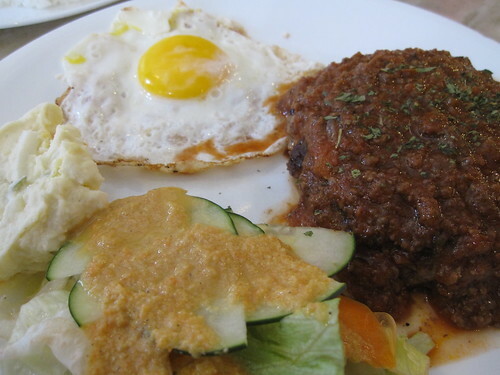 It doesn't matter to us, we go for the hamburg rice, an always satisfying plate of hamburger patty in sauce, potato salad, fried egg, green salad and side of rice.